Despite being next to the Brompton Oratory and the Victoria and Albert Museum, Brompton Road was another Piccadilly Line station closed due to low traffic. Situated between Knightsbridge and South Kensington, it was open between 15/12/06 and 29/07/34. 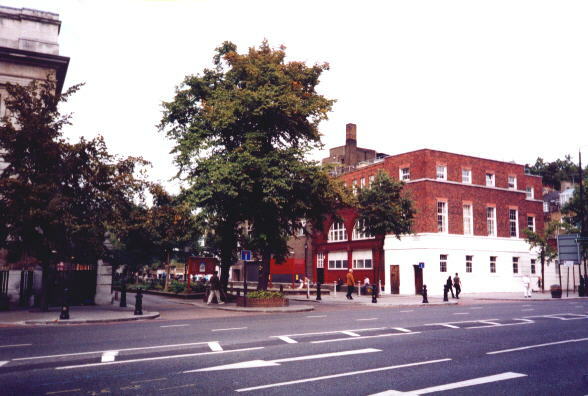 The main part of the L-shaped surface building faced onto Brompton Road itself, with a smaller portion in Cottage Place, and a pub standing on the corner. During WW2 the lift shaft was used as the operations centre for the 1st Anti-Aircraft Division, while the platforms were bricked off from the trackside and used as office accomodation. After the War the building was transferred to the Territorial Army (UK equivalent of the US National Guard). 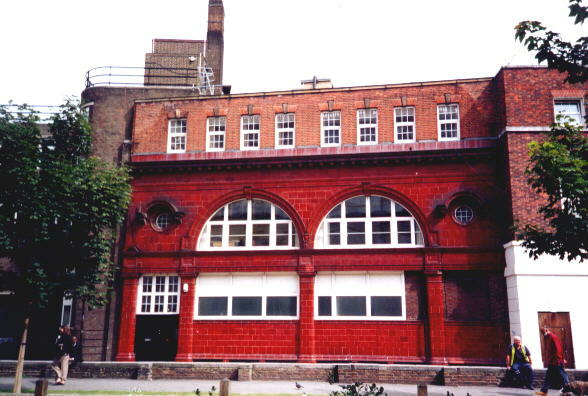 In 1972 Brompton Road was widened, leading to the demolishion of the larger part of the station building, its replacement by the white-fronted facade seen in these photographs, taken in September 2000. The side entrance remains largely untouched. As at Down Street, the screen walls on the platform were not removed, and so all that is noticable at track-level is a brief change to open brickwork on the right of the train, and very grimy tiles on the left.